October 2016 Issue of Informer: The History of American Crime and Law Enforcement. 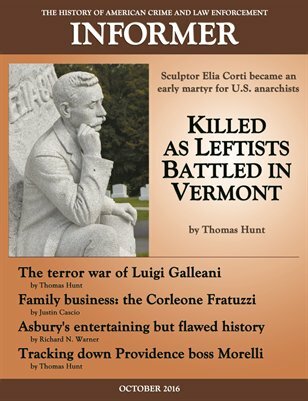 Contents: Leftist radicals clash in Barre, Vermont, by Thomas Hunt / A family business: The Fratuzzi of Corleone by Justin Cascio / Warner Files: History must be more than the repetition of legend by Richard N. Warner / The Galleanists' war of terror / 'Wiser Guy' recalls the wiseguys (book review) / Book news / Just One More Thing: On the trail of Providence boss 'Butsey' Morelli by Thomas Hunt / 100 Years Ago - 1916. 48 pages including covers and nine pages of advertisements.